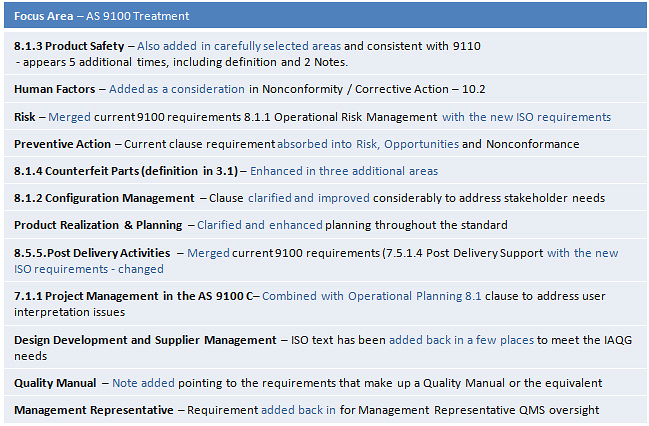 AS 9100 Rev D changes have been incorporated inline with Annex XL format. This will help organisations to use this standard to integrate with other management system standards. Configuration management has been improved and clarified. Project management has been added in Operational planning and is more clear. Counterfeit parts – more clear and more emphasis added. Human factors – Nothing new about this in the aircraft industry. However in the standard this has been added to enhance root cause analysis when non conformities arise. Preventive action – As in other new standards, this term has been replaced with Risks.